Lahore, October 13: Media persons attending a one-day briefing session on the ‘State of Right to Information in Pakistan’ held here today were urged by the Information Commissioners from Khyber Pukhtunkhwa (KP) and Punjab to popularize the Right to Information (RTI) laws in Pakistan and educate the public on how to use these laws for getting better services. The truth of government performance can now be accessed by the media as well as the public under the fundamental right to information in KP and Punjab, observed the provincial Information Commissioners from both the provinces. Organized by the Pakistan Institute of Legislative Development and Transparency (PILDAT), the lively briefing session was attended by more than 30 journalists from print and television media. The session’s panel speakers included Mr. Mukhtar Ahmad Ali, Punjab Information Commissioner, and Mr. Abdul Matin Khan, KP Information Commissioner. Other prominent participants included Mr. Mujeeb-ur-Rahman Shami, Chairman, Council of Pakistan Newspaper Editors; Mr. Rana Azeem, President, Pakistan Federal Union of Journalists, Mr. Atta-ur-Rehman, Senior Journalist; Mr. Javed Farooqui, Bureau Chief Lahore, Capital TV and Mr. Javed Jabbar, former Senator and Federal Information Minister. KP Information Commissioner, Mr. Abdul Matin Khan, informed the audience that the provincial RTI law has received great support from the media and the recent repeal of controversial amendments to the RTI law by the KP Assembly would not have been possible without the pressure generated by the media. “Already, the law has been used by citizens in KP to inquire about government expenses, recruitments and transfers in addition to accessing information health by organizations and improving the standards of medical facilities within prisons,” he noted. Punjab Information Commissioner, Mr. Mukhtar Ahmad Ali, urged the media persons in attendance to begin reporting on Pakistan’s fledgling RTI movement more regularly, as this will help expedite the passage of the country’s internationally acclaimed RTI Bill, which was finalized almost two years ago but has been pending enactment by the Parliament. “The RTI law empowers reporters and journalists to pursue and investigate the stories that interest them personally, and provides them with a reliable and effective means of verifying this information,” he said. Mr. Ali was of the view that information obtained through RTI requests is more accurate and verifiable than information obtained through the media’s traditional interaction with ‘sources’. Addressing the session, Mr. Javed Jabbar observed the irony in the fact that the Freedom of Information Ordinance 2002 had been passed by a military-backed government, while previous such efforts had failed during the civilian governments of both Ms. Benazir Bhutto and Mian Nawaz Sharif. “Despite more than seven years of continuous civilian rule since the overthrow of the military government which passed the FOIO 2002, no significant improvements have been made to the law,” he remarked, while calling on citizens and the media to pressure the government in passing more effective RTI laws and ensuring their effective implementation. While opening the Briefing Session, Mr. Ahmed Bilal Mehboob, President PILDAT, called on media persons to press upon the government to update the outdated FOI laws in effect at the Centre and within Sindh and Balochistan provinces, which fail to meet even the most basic international standards on RTI. Mr. Bilal Mehboob quoted the example of PILDAT’s information request under the FOI Ordinance 2002, for access to MNA attendance records, due to which the proactive disclosure of these records has become a norm within all legislatures of Pakistan today. During the event PILDAT provided the audience with various publications on RTI, including Briefing Paper on Right to Information and the News Media, Activating the Right to Information in South Asia as well as Key Messages for Media on RTI. 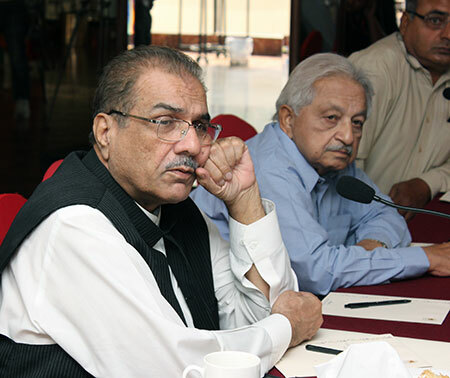 The one-day Briefing Session for News Media on the State of Right to Information in Pakistan was organized by PILDAT under the “More effective Right-To-Information (RTI) at Federal and Provincial level (Sindh and Punjab)” project, which is supported by Development Alternative Inc. (DAI) under the Enhanced Democratic Accountability and Civic Engagement (EDACE) project.